Walter McDougall is America’s greatest living historian. His The Heavens and the Earth: A Political History of the Space Age (1985) earned him the Pulitzer Prize. His Promised Land, Crusader State (1997) summarized American foreign policy from the founding to our own time while explaining twentieth-century statesmen’s radical departures from their predecessors. In Freedom Just around the Corner: A New American History, 1585–1828 (2004) and Throes of Democracy: The American Civil War Era, 1829–1877 (2008), he weaved ideas, technology, customs, politics, and mores into a tapestry that illustrates America from its earliest roots through its growth into its current form. In lieu of a third volume taking that history through the twentieth century, his new offering treats the history of the United States in our time through the lens of foreign policy. In short, this book is at least as much about what America has made of itself during the past century, how that happened, and what this portends, as it is about how America has dealt with the rest of the world. The reason for this approach to American history is McDougall’s recognition of the unique paramountcy of ideas—especially religious ideas—in what makes America. Reference to God has been the standard by which Americans have judged right and wrong, better and worse, since long before Alexis de Tocqueville observed the pervasiveness of religion in American life. Even Barack Obama, whose administration so often put religious groups on the defensive, continued to ground his legitimacy in the basic symbols of Christianity. McDougall thus highlights America’s departure from its founding by examining the changing interplay between Judeo-Christianity and the civic rituals, invocations, sacred texts, and civic piety that McDougall calls our “civil religion.” Since Orestes Brownson aptly described America as a nation with the soul of a church, there may be no better way to illuminate our country’s true character. Thus the book’s subtitle, How America’s Civil Religion Betrayed the National Interest, conveys what the book is about even more accurately than does the title. Arguably, foreign policy is the most visible field in which the American ruling class’s ideas have morphed over time. Originally our national posture relied on Deuteronomy’s injunction to obey the Lord’s commandments so that “all people of the earth shall see that thou art called by the name of the Lord.” Nowadays, reversing the polarity, we are more apt to act as if some higher power entitles American leaders to impose their preferences on the rest of mankind—and on ordinary Americans. In a chapter titled “Why the American Heresies?” McDougall outlines the book’s thesis: the confusion of one’s own will with God’s will is the oldest and most compelling of stories, a reprise of the Serpent’s successful temptation of Eve. America’s British fathers had “tamed the church by placing their own monarch instead of the pope at its head; then they tamed the monarch by asserting parliamentary supremacy in 1688. . . . In other words, their kingdom—the United Kingdom—was of this world, and to render unto Caesar was to render unto God. . . . They baptized themselves a new chosen people in the vanguard of human progress.” Thus did British colonists dispossess the Irish and the Indians with clear consciences. “Eloquent preachers from Jonathan Edwards to George Whitefield had prepared Americans to imagine themselves as a new chosen people in a new promised land with a millenarian destiny.” Americans called their God by different names. 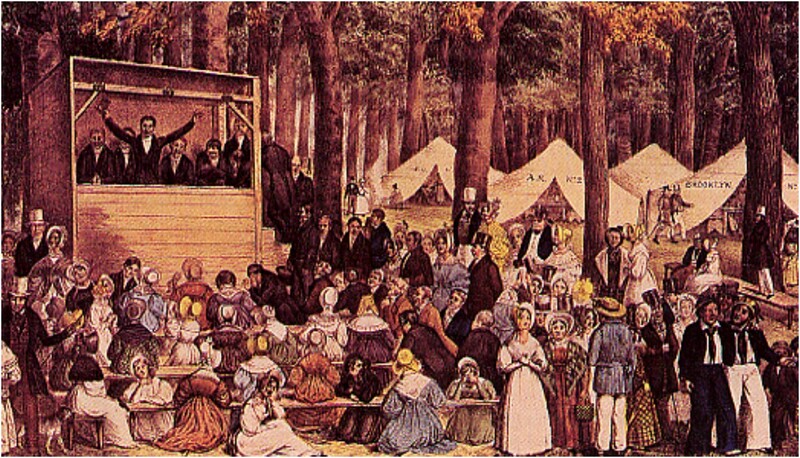 The “secret of the First Amendment” was that “it silently established a civil religion to which all sectarian believers must bow.” The essence of that civil religion was to make Americans feel good while doing well—to minimize consciousness of sin while maximizing self-praise, and hence to bless ever-increasing hubris and rapacity. The book is about how this ever more secularized Puritanism, ever more certain of its own salvation and of its entitlement to reform reprobates, ever holier and trendier than thou, vexes us all. In subsequent chapters on Washington, Jefferson, and John Quincy Adams, McDougall celebrates Washington as the epitome of sober, salubrious statecraft. He quotes at length Washington’s injunction to give humble thanks for blessings while maintaining peace and justice, and practicing reciprocity toward all nations. He quotes as well Washington’s letter to Lafayette, in which he states his desire to see “the sons and daughters of the world in Peace, and busily employed in fulfilling the first and great commandment, Increase and Multiply,” and to see America’s lands as a place where one “who wants to cultivate, may repair to thither and abound, as in the Land of promise with milk and honey.” Jefferson, like Washington, came to terms with the fact that America had to be “in the world but not of it.” McDougall notes that John Quincy Adams—whose views would define the paradigm of American foreign policy for the rest of the nineteenth century if not more—also rejected millennialism with every bone in his body: “We may boast,” he wrote, “that we are the chosen people; we may even thank God that we are not like other men; but, after all, it will be but flattery, and the delusion, the self-deceit of the Pharisee.” The Monroe Doctrine, writes McDougall, was “a great exercise in self-containment.” The rest of the book is about how the logic of heresy overcame these founders’ sobriety. Beginning from McDougall’s chapter on Manifest Destiny, scarcely a kind word is to be found concerning any American. Even Lincoln’s 1846 objection to the pretense by which President Polk started the Mexican war (Mexicans had fired on Americans on American soil, though the spot’s sovereignty was disputed) was a “ploy” similar to the one Lincoln later used to start the Civil War. But, as McDougall knows, Fort Sumter had not ceased to be U.S. government property when the Confederates fired on it. McDougall also agrees with the view, stated by Anne Hyde, that the U.S. government brought nothing but “mayhem and massacre” to the conquest of the West. He treats the modesty of William Seward, Henry Clay, and Daniel Webster as passing anomalies. Instead, the norm had become Americans’ growing itch to use the government to impose themselves abroad as well as on lesser citizens at home. Hence Ulysses S. Grant: “Our Great Maker is preparing the world, in His own good time, to become one nation, speaking one language, and when armies and navies will no longer be required.” President Benjamin Harrison might well repeat the Washingtonian and Lincolnian maxim that the only true threats to America were lax morals and inattention to the laws of nature and nature’s God. President Grover Cleveland might even spurn the Americans who had overthrown Hawaii’s monarch and were asking for annexation. But McDougall’s point is that, in the minds of pastors, poets, and politicians, the itch for consecrated empire could do nothing but grow. What clergy saw as the will of God, secular intellectuals saw as the inexorability of scientific reason, best fit, in the words of historian Bruce Kuklick, to “manage God’s universe for the benefit of mankind.” This new task, however, required divorcing power from consent, which is just what the Supreme Court did in the “Insular Cases” of 1901, effectively repealing the Northwest Ordinance of 1787 and 1789. The Northwest Ordinance had ensured that, in subsequently acquired territories, there would never be a distinction between rulers and ruled. Now there could be—so long as the rulers were sure that they would rule for the good of those ruled. steered the ship of state with a geopolitical compass and moral rudder that rarely disagreed. . . . He could pursue America’s God-given destiny without apology, doubt, or excess. When he sometimes overreached—for instance, in the Philippines—he learned never again to “swallow a porcupine wrong-end to.” . . . Most of all, Roosevelt was realistic in the sense of balancing ends and means. . . . The best and safest course was to promise little, keep one’s promises, and otherwise speak softly and carry a big stick. . . . So calling TR a realistic nationalist and Wilson an idealistic internationalist is not incorrect. It just doesn’t begin to capture the enormity of the gulf. And then America fell into the other side, because the Republicans who replaced Wilson—Harding, Coolidge, and Hoover—were even more committed than he to building heaven on earth. They differed primarily in the amount of military power that they were willing to devote to the task. Theirs were the Washington Treaties of 1921, arguably the greatest abandonment in U.S. history of the correspondence between ends and means, as well as the 1929 Kellogg-Briand Pact that outlawed war. Both of these, in the end, helped bring on a second World War. And it was they who ran Prohibition—the biggest ever effort to moralize America, which corrupted as little else. McDougall reports that William Randolph Hearst bankrolled a movie, Gabriel over the White House (1933), about a president who “miraculously transformed into that Platonic ideal, the benevolent dictator.” That, of course, is the whole rationale behind the campaign for the administrative state, which Progressives have waged since the 1870s. FDR loved the movie. More important, the taste for supposedly benevolent administration was widespread enough in those years to lead countless American Progressives to see all manner of good and imitable things in the regimes of Benito Mussolini, Adolf Hitler, and especially of Joseph Stalin. The archives of America’s prestige press bear witness to how unshakable was that passion. Diplomatic recognition of the Soviet Union in 1933—just as the genocide-by-starvation of the Ukraine was getting into high gear—was Franklin Roosevelt’s only major foreign policy initiative between his inauguration and 1940. Only outright lies could balance the equation between religious universalism and pro-Soviet foreign policy. FDR delivered them with a straight face. The Soviet constitution of 1936, he said, guaranteed religious liberty. America did not believe him. That disbelief helps explain why, especially after June 1941, when Germany broke the Molotov-Ribbentrop Pact and invaded Russia, only an attack on America itself could convince the vast majority of Americans to enter a war whose winner would be either Hitler or Stalin, both equally godless. That in turn is why FDR resisted all attempts to bring the question of war and peace to Congress and why he yearned for Germany or Japan to do something that would outrage Americans. In this world of illusions, wars are not really wars, even though thousands of people kill and die in them. The first instance occurred in Korea, 1950. The United Nations had banished war, had it not? North Korea’s Chinese-backed invasion of the South confronted the ruling Democratic Party—which had staked its reputation on Mao Zedong’s benevolence—with the alternative of letting that invasion succeed or fighting a war to defeat it. By the cleverish pretense that this was not a war but a “police action,” America’s rulers ducked the choice and held on to their illusions. But some fifty thousand of the Americans they sent to serve that illusion did not come back. Beyond lives and treasure, the cost of the American ruling class’s illusions about no-win wars includes the incalculable toll of domestic decay resulting from Vietnam, Iraq, and Afghanistan. But because Korea was such a turning point, it is sad to read McDougall’s throwaway explanation of it: “The Korean war was a limited conflict because Truman dared not risk escalation after General Douglas MacArthur’s reckless foray to the Yalu River drew in the Chinese.” For the record: Truman had authorized MacArthur to occupy land north of the 38th parallel on October 8, 1950. MacArthur’s troop movement began on October 24. The first encounter with Chinese troops occurred on October 26 some eighty miles south of the Yalu River border. How many months does anyone think it had taken Mao to muster half a million men and their equipment to China’s remotest northeast? Why had he sent them there? Did Mao make his decision to intervene directly in two weeks, or was it in two days? Here McDougall repeats a familiar trope of the U.S. foreign policy establishment’s left wing. Mao intended for his side to win—with North Korean troops if possible, with Chinese ones if need be. McDougall’s treatment of America’s subsequent wars suggests a reason for his visceral opposition to U.S. military actions: he sees as few do the connection between the U.S. ruling class’s adventurism abroad (what but “adventurism” to call a series of half-hearted, incompetent failures?) and its grasping for unaccountable power at home. “Americans were told that Third World countries could not be expected to choose democratic capitalism so long as racism and poverty existed in the United States itself (as if Vietnamese or Congolese peasants had a clue about life on the South Side of Chicago).” All of this was bound together by a post-religious sense of sacred mission. Lyndon Johnson’s 1965 inaugural assured his “nation of believers” (in what? one might ask) that our enemies would be defeated by “the faith they could not see. . . . For this is what America is all about. It is the uncrossed desert and the unclimbed ridge. . . . Is a new world coming? We welcome it—and we will bend it to the hopes of man.” Guided by this lodestar, this class has wasted lives, treasure, and respect on equivocal ventures and “impossible dreams” abroad while inexorably piling layer after layer of the administrative state upon Americans at home. McDougall’s earlier works had mentioned America’s civil religion and noted its corruption. In Tragedy, however, he forthrightly begins by presenting the George W. Bush administration’s decision to invade Iraq as the apotheosis of that corruption. McDougall evokes this corruption by referencing a cartoon of a “decrepit and empty” building surrounded by garbage and displaying the American flag. The caption: “Gone nation-building.” For McDougall, that decrepitude consists mainly of the U.S. government’s extension and intensification of the prerogatives that it had accumulated in the course of fighting the Soviet Union: “It seemed only logical that the militarism, propaganda, and imperial presidency, not to mention the federal regulations, direct taxes, and welfare state needed to sustain public support for the warfare state, would also now come to an end” after the fall of the USSR. Instead, the “global war on terror” swiftly cemented insecurity abroad and reduced freedom at home. contradictory goal of “a united, democratic Iraq.” McDougall knows this history, and knows that expeditions to kill enemies are very much part of statecraft’s historic toolkit. But he also argues that, by invading and occupying Iraq (he makes no distinction between the two), George W. Bush “gave the public what it demanded . . . disproportionate vengeance and perfect security, while pretending their government’s wars were part of a universal crusade.” Yet he knows that the American people have never been on board with nation-building, and that they had elected Bush on the basis of his pledge to do no such thing. So strong is McDougall’s aversion to anything resembling America’s assertion vis-à-vis foreign nations that he (again without explanation) endorses the attempt during the 1970s to deal with the Soviet union by détente. McDougall is happy that the Soviet monster disintegrated. But he seems to believe that, since it happened, it had to happen, and hence that our fighting the Cold War was counterproductive. Yet détente ceded to the Soviets a monopoly over warfighting ballistic missiles while, as Kissinger staffer Helmut Sonnenfeldt told U.S. diplomats in Europe, not disturbing their enjoyment of their empire. Must U.S. Foreign Policy Be Irredeemable? Yet this type of lofty rhetoric, too, is a dangerous illusion. Nations must pursue their own security, and in that respect the United States is no different. As McDougall shows, our political leaders and foreign policy establishment have distorted the lens through which American security might be viewed—first with their “civil religion” of Manifest Heresy, later with their use of war partly to build a powerful state at home, and most recently with their crusades on behalf of a caricature of liberal democracy. McDougall’s proper skepticism of our civil religion, however, sours his judgment of American military actions to the point of cynicism—a point from which one cannot easily offer guidance on what should be done. The American people, as opposed to the American ruling class, have never completely embraced or internalized these ideologies, and this fact should give McDougall greater hope. Throughout the Western world, and preeminently in America, hundreds of millions of people have turned (and are turning) their backs on the ruling class and its civil religion. Whether this results in the end of America as an exception to mankind’s mores or not, and whether or not it leads to the deadly disruptions typical of revolutions, it is surely a reassertion of human nature against man-made illusion. 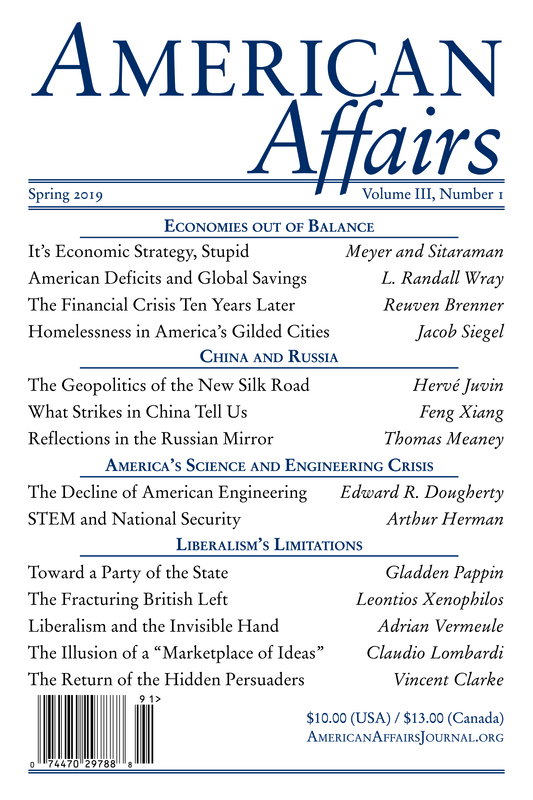 This article originally appeared in American Affairs Volume I, Number 2 (Summer 2017): 209–18.